I bet that you got hungry just by looking at the picture above. 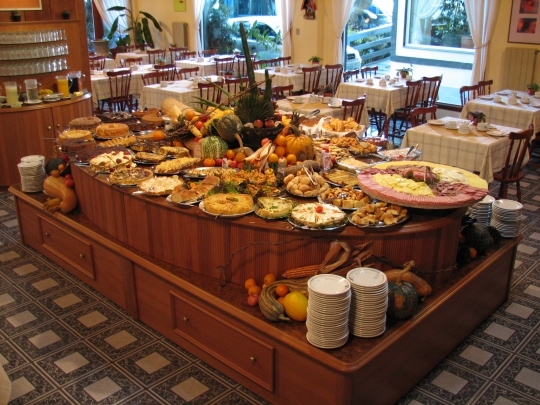 That is a typical breakfast buffet at hotels in Brazil. Doctors say that breakfast is the most important meal of the day. We, Brazilians, agree. We do take our time to eat a rich café da manhã. One of the most traditional breakfast foods in Brazil and especially in the Brazilian Northeast is cuscuz. 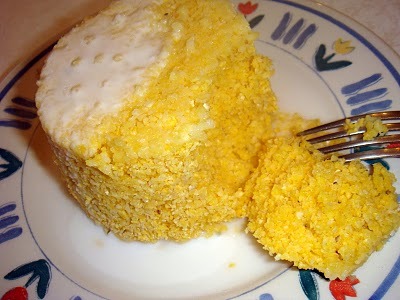 It is a cake-like food made of steamed corn bran, water, and salt. It is very nutritious; therefore, it is the #1 choice for those who need a lot of energy to endure a day of hard work or sightseeing around Brazilian towns. Some people like cuscuz with milk, some like it dry with scrambled eggs, and others like it with chicken or beef. Some Brazilians like it so much they even eat it for lunch or dinner as well. To learn more breakfast vocabulary, check out my new set of flashcards below. Now you can also listen and practice the pronunciation of each word. We would like to thank Quizlet developers for working hard to make this happen. Please, tell us know what you eat for breakfast and I will be glad to add it to our list if it is not there yet.